Book and Lyrics by Evan Thompson and Joan Shepard, Music and Additional Lyrics by Joe Bousard, Based on the poem by Robert Browning. The legend goes that in the year 1284, the German town of Hamelin was overrun by rats when the mysterious piper dressed in multi-colored clothes arrived. He claimed he could lead the rats from the village. The mayor promised the town would pay him for the service, but after the Pied Piper led the rats away by playing a magical tune, the townspeople wouldn�t pay the piper. For this, the Pied Piper played his tune again and led all their children away. 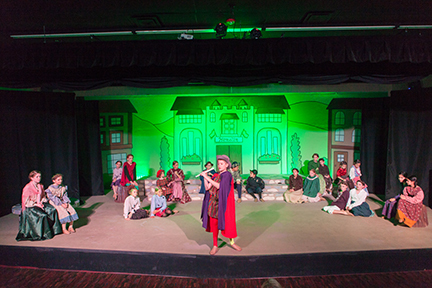 This new incarnation of the tale features highly entertaining comedy and characters along with a marvelous musical score that introduces us to the quirky townspeople and the mysterious piper. Musical Theatre of Anthem gave this new show its debut, with Laura O�Meara directing a production that is spellbinding from start to finish. 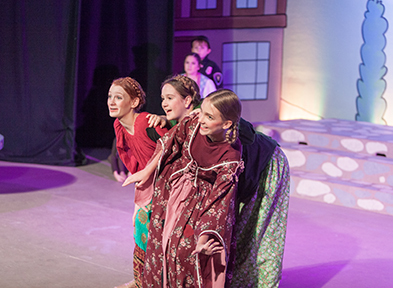 The show looks as adorable as it is with some nice backgrounds of quaint town settings, costumes by Lorraine Bousard, and very cute and detailed hair-braiding. 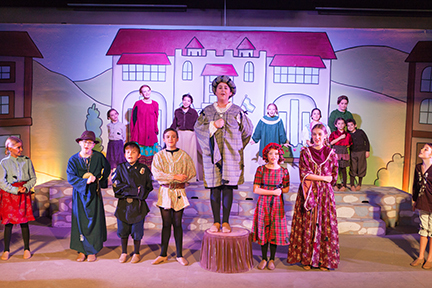 And their cast of ages 6 to 13 is equally cute and detailed, putting on a remarkably polished production after just a few days of intensive summer rehearsals. 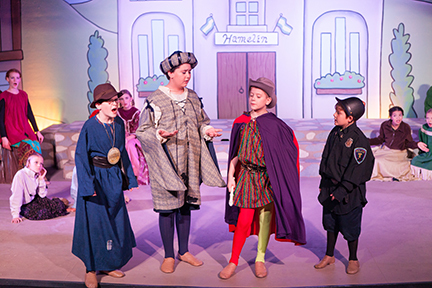 Fifth grade student Jacob Blalack is The Pied Piper, called to help the town through a Charm, arriving with confidence and swagger and salesmanship as he assures them he can rid their town of rats for the reward they�ve offered. Which indeed he does with some good singing of a mesmerizing The Land of Anywhere. A song he�ll reprise when the town balks at paying him the promised fee � A Thousand Guilders. Parker Gates shines as Peter, one of the older kids in town hobbled by a lame foot but with a sharp mind intent on helping the town and gaining the affection of Gretchen. 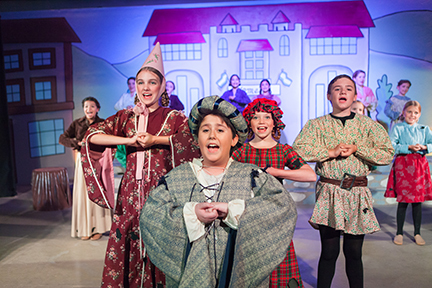 Extremely talented Davin Kallevig is said Gretchen, a precocious girl who leads the effort to bring the magical piper to town with the assistance of her gorgeous singing. And the town is filled with an assortment of other colorful characters including Lucas Kucera as the Lord Mayer Gerhard Gseundheit, Emma Suttell as his amusing materialistic wife Lena who can easily breeze through a thousand guilders as she leads a memorable Shopping trip, the judicious Herr Ottendorfer (Trevor Kimball), and police chief Colonel Klaus Krankenfuss (Garrett Hale) whose attempt to arrest the rats goes awry. The cast kicks it all off with a determined and amusing Down with the Rats choreographed by Danielle Cicogna, and they keep the humor and charm up right on through to The Other Side, all adding much personality to their various characters as desperate citizens, imaginative children, greedy townspeople, and eventually repentant townspeople who learned a few valuable lessons along the way.